New for 2014 from Vertx is their Phantom Ops pant powered by an Active Airflow System and designed by Fighter Design. These pants were designed for hot weather environments and allow air to circulate around the legs through mesh inserts along the inseam from mid-thigh to ankle and inside the cargo pockets. These pants are extremely durable while comfortable to wear. The Phantom Ops pant have a total of 10 pockets (5 per side) to include a slim pocket on each hip and dual concealed zipper pockets for discrete carry. The pants are constructed with 6.5 oz 65% Polyester/35% Cotton mini Rip-Stop fabric with IntelliDRY treatment and 100% Polyester mesh to prevent shrinking. The Phantom Ops will be available in mid-April. For more information visit, vertx.com. New from Mega Arms in 2014 is their new Megalithic Tactical System that is available for both the 5.56mm and MATEN (.308AR) platforms. This one-piece upper receiver and rail system will be available in Mid and Rifle lengths for 5.56mm and Rifle length for the MATEN. The Megalithic Tactical System incorporates a strategically integrated level system and the Key-Mod versions come with hardened QD sockets on the rear sides of the rail. For more information visit, megaarms.com. 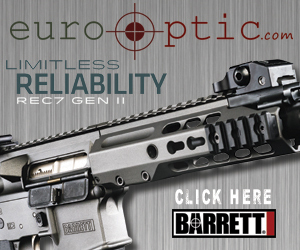 Vortex Optics has announced several upgrades to their product line for 2014. Of note is the upgraded Strikefire II. The Strikefire II has removed the night vision button which previously caused users problems with the optic appearing to have turned off and incorporated the NV function in the brightness settings. The Power Control Group Housing has been beefed up to provide an even more robust system. The Strikefire II includes a cantilever ring mount, uses a single CR2 battery which will last for 400 hours on the Bright Red setting and 300 hours on the Red/Green setting. The Strikefire II retails for $239.00. For more information visit, vortexoptics.com. A new weapon maintenance tool for 2014 from Otis Technology is the Otis Ripcord. This one pass cleaning tool is available in common handgun and rifle calibers, with more coming, and offers 360° barrel cleaning from end-to-end. The Ripcord has 8-32 threaded ends for accommodating additional Otis cleaning components. The Ripcord retails for $14.99. For those who are familiar with the Otis MSR/AR Cleaning System and B.O.N.E. Tool in the .223/5.56mm variant has been expanded to the .308/7.62mm market for 2014. The .308/7.62mm B.O.N.E. will also be sold separately. The .308/7.62mm B.O.N.E. Tool retails for $29.99. Additionally, stepping outside of being known for quality cleaning supplies, Otis Technology has introduced the MSRS, a 6061-T6, two-piece, free-floating rail for the MSR/AR/M4 platforms that mounts to a standard barrel nut. The MSRS Rail retails for $239.99. For more information visit, http://www.otisgun.com/, or call 1-800-684-7486. TAC-CON has introduced a new three-mode drop-in AR trigger for 2014, which is a non-NFA part and has received the blessing of the ATF. The three selector positions for this trigger are Safe, Match-Grade Semi-Automatic, and TAC-CON 3rd Mode of Operation. The TAC-CON 3MR Trigger System requires a pull of the trigger for each round fired and is not a “bump-fire” or fully-automatic system. The 3rd Mode of Operation is achieved by the trigger resetting just as the casing is being ejected and the bolt is still moving rearward, creating an assisted reset. The 3rd Mode trigger reset is approximately half the distance of the semi-automatic reset. The 3MR Trigger retails for $495.00. For more information visit, http://tacfirecon.com/. New for 2014 from Sig Sauer is their new P320, Polymer-Frame Service Pistol. The P320 will be initially available in 9mm, .40 and .357SIG, with .45ACP expected later in 2014. The P320 can be converted not only from a full-size duty pistol to a conceal carry pistol, but the slide and barrel can be changed out to provide choices of barrel lengths and caliber. Though available as an option, the P320 does not come standard with an external safety. There is a reversible magazine release to accommodate left-handed shooters. The P320 retails for $713.00. For more information visit, http://www.sigsauer.com/. X-Products has introduced several new 50 round drums for varying weapon platforms for 2014. Of note is their MP-5 9mm 50 round drum, that loaded weighs in at under 2 lbs. The MP-5 model will only be available in black and the price has yet to be determined. Expect this drum to be available in late June. Also available are 50 round drums for the AR 9mm Colt Platform, the HK 33, 53, and 93. The drums are available in solid, skeletonized, and the new chevron cut skeletonized versions. For more information visit, xproducts.com. New for 2014, Surefire has released two new handgun mounted lights, the X300U and the X400-IR Ultra. Both lights offer a 500 lumen beam, 1.5 hour run time light run time, offer ambidextrous switches, and require 2 CR123 batteries. The X400-IR Ultra features a 5mw (500nm IR) laser with a 24 hour run time. Surefire has also announced a new suppressor for 2014, the .22LR Ryder22. The Ryder22 is the lightest .22LR can on the market at 3.1 oz, has pig nose baffles, and can be disassembled for cleaning. The baffles are anodized red so the user knows when cleaning is done and the baffles are also numbered for proper reassembly. The Ryder22 retails for $469.00. For more information visit, http://www.surefire.com/, or call 1-800-828-8809. S.W.O.R.D. International has introduced a new high caliber AR-style rifle for their 2014 inventory. The Mk-18 Mod 0, chambered in .338, is a semi-automatic gas piston operated rifle with a 22 inch barrel, 7075-T6 receivers, full-length free-floating KeyMod rail, and a non-reciprocating side charging handle. The Mk-18 Mod 0 retails for $6995. For more information visit, http://sword-int.com/. The Bullet Bunker introduced “The System” for 2014 which features their Freedom Model bullet trap and adds a SACON (Shock Absorbing Concrete) façade to prevent ricochet and errant rounds from straying away from the target area. “The System” is rifle round capable and has been tested up to .458 Win Mag and .470 Nitro Express. The 4’x6’ model retails for $2499.99 and the 4’x8’ model for $2699.99. For more information visit, http://thebulletbunker.com/, or call 1-419-341-1416.